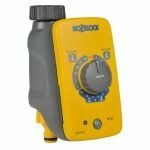 This product information page is designed to help you decide whether the Hozelock Sensor garden watering controller is right for you. It includes links to the top online retailers’ websites to save you time finding the best deal. Where to find the best price for the Hozelock Sensor Controller. The Hozelock Sensor Controller connects directly to a garden tap and to a hose pipe (which may in turn be connected to a garden sprinkler or an irrigation system). It is capable of watering one zone. The watering start time is set by rotating the control dial to one of the three marked sections: Sunrise, Sunset or Sunrise and Sunset. The controller will open the valve every day. The watering duration is set by setting the dial to the required time (2, 5, 10, 20, 30 or 60 minutes). ‘Water now’ function. You can turn on the water controller at any time by pressing the 'Water Now' button once. Press again to turn off at any time. Battery level check. Press and hold down the 'Water Now' button to check the status of the batteries at any time. Battery fail protection. A built in safety feature detects when the battery levels have dropped to a level that could fail whilst the valve is open and result in wasting water. The safety mode prevents the controller from turning on until the batteries have been replaced. 1 hour delay. If you install two Sensor Controllers this feature allows you to delay the start times on one of them to prevent pressure loss when two appliances are used simultaneously – for example sprinklers.